Each piece from Tracy Gilbert is handcrafted in Dublin with love of Irish roots, history and folklore. To help you care for your jewellery, I have put together a short and easy guide full of tips to ensure that your piece remains in lovely condition and can be passed on through the generations. If in doubt and for the best possible clean, it’s probably best to take your precious metal jewellery to a professional to be cleaned, but there’s a few things you can do at home that will bring your jewellery back to a nice shine. As you probably already know, silver jewellery can tarnish but it is fairly straightforward to remove tarnish by using a good silver polishing cloth (I would recommend the Town Talk Silver Cloth which is available in lots of places or a silver polishing cloth purchased from a jewellery store). This brings back silver’s lovely shine and lustre. 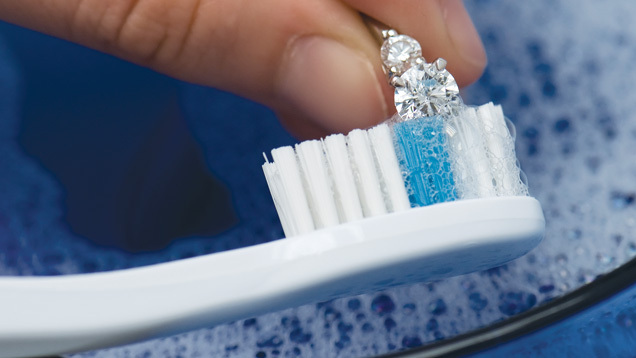 For gold and platinum, using an old toothbrush and some warm soapy water will help bring the shine back to the metal. First, soak the metal in the warm soapy water for a few minutes, and then brush the piece gently with the old toothbrush. Going too hard could damage the metal, so tóg go bog é (take it easy in Irish!). Once clean, rinse in warm running water and dry with a clean soft cloth or place on top of kitchen roll. You can finish the cleaning process by giving the metal a final gentle rub with a cloth once dry. It is also OK to place silver, gold, platinum (including the translucent acrylic used in many of Tracy’s pieces) pieces into an ultrasonic machine (available in some supermarkets). This will clean the jewellery beautifully. Rinse the pieces in water and place on kitchen roll to dry. Use a soft cloth to polish lightly. As a general rule, I wouldn’t recommend the ultrasonic for cleaning any jewellery with gemstones/pearls as depending on the hardness of the gemstone (Mohs scale), the stone could crack and shatter in the ultrasonic. To clean a piece with gemstones effectively without worrying about damaging the stones, it’s probably best to take it to a jeweller to get it professionally cleaned. If however you can’t send the jewellery and would like to do it yourself, there are a few ways to quickly clean them at home. Try the old toothbrush and soapy water as suggested above and take it very easy. You need to be careful with the temperature of the water – some gemstones (e.g. pearl and peridot) don’t react well under high temperatures. Your jewellery should be the very last thing you put on before you leave the house. Why? Putting your jewellery on first and then spraying body sprays, perfumes or hairspray can cause issues. These sprays are typically loaded with chemicals (even alcohol) that can erode the piece of jewellery over time. Don’t stress if you’ve done this before – I’m a disaster for it and it hasn’t caused me any trouble but it’s important to know that this can effect some jewellery and just to be mindful of it when getting ready to go out. It shouldn’t be expensive to get your jewellery cleaned professionally. This often includes an inspection to ensure that all gemstones remain secure. Jewellers know gemstones very well and know how best to clean them. They tend to have a very powerful ultrasonic with heat control that loosens up any dirt/grime build-up without damaging the piece. Every few months, I clean my engagement ring in the ultrasonic and am wowed all over by its sparkle! This entry was posted in Tracy and tagged clean, gold, heirloom, heirloom jewellery, jewellery care, jewellery cleaning, platinum, polish, silver.